The perfect fall side dish has arrived! 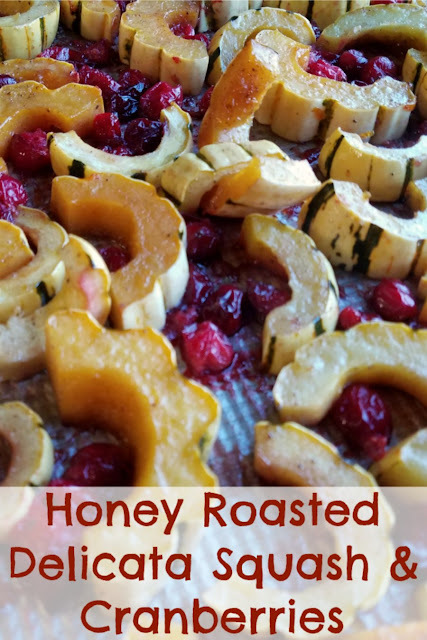 The combination of roasted delicata squash and cranberries lightly glazed with orange and honey will make your dinner plate sing! This roasted delicata squash is the perfect fall side dish. It is just a little sweet from the honey and a little tart from fresh or frozen cranberries. Plus there is a hint of citrus to bring it all together. We got a lovely haul of winter squash the last few weeks of the CSA season. I set them aside to use up the more perishable produce first. By the time I got back to the squash, I think it had multiplied. There was a mountain of different varieties waiting for me! That is a good problem in my world, I love squash. So we've been having it every which way. I did some in our new air fryer and that was delicious. I hope to share a recipe soon. 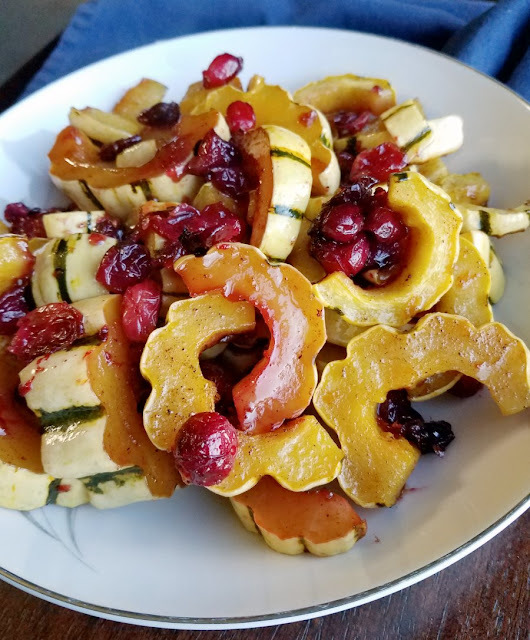 But this mix of delicata, honey and cranberries is perfect too and doesn't require any equipment you aren't likely to have. I used some cranberries I froze during last year's season. You could also use fresh berries. If you want to use dried, I'd either throw them in towards the end or soak them in water or orange juice before using them. My husband and I were both huge fans with how this turned out. I'm definitely making more and maybe I'll sub in slices of acorn squash next time! What are your favorite ways to fix winter squash? We still have a whole pile of acorn, delicata, butternut and spaghetti squash left. Preheat oven to 400 F and grease a sheet pan. Clean squash, cut them in half and remove the seeds. Cut squash into 3/4 inch slices. 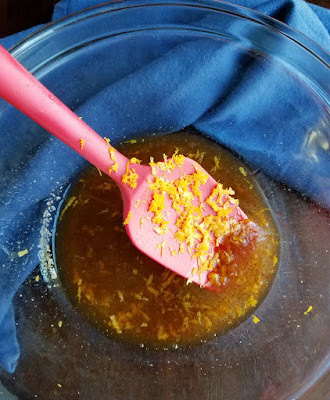 In a mixing bowl, stir together oil, honey, cinnamon, salt, pepper and orange zest if using. 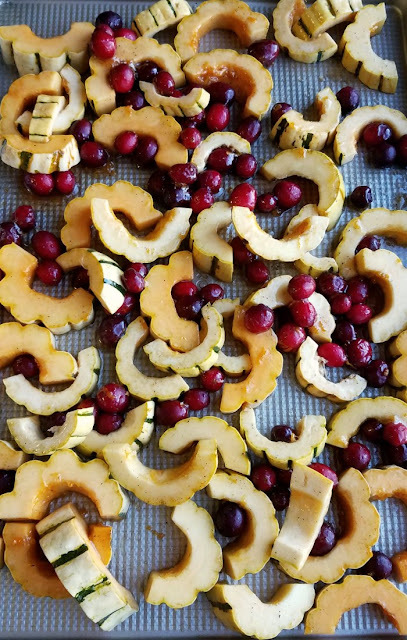 Toss the squash and cranberries in the honey mixture and spread over prepared sheet pan. Roast for about 35 minutes, stirring half way through. What a beautiful guests would be wowed with this yummy squashness!!! I bet the flavors are incredible! Have the sweetest weekend precious friend! 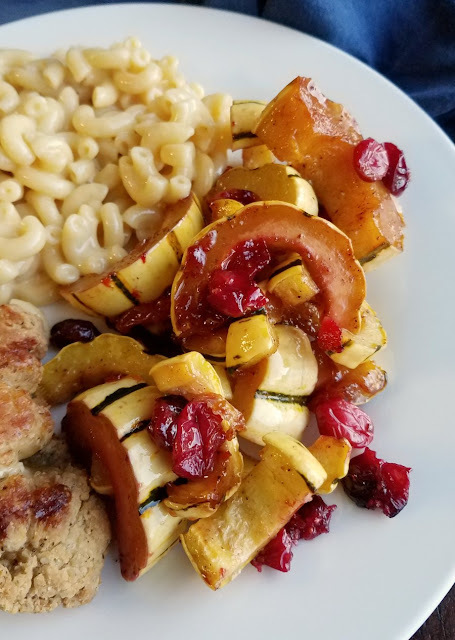 I keep hearing amazing things about delicata squash! It needs to find it's way onto my to-make list. Delicata is one of my most favorite squashes, and you made such a beautiful dish out of it. Stunning presentation! Thank you! I only started using delicata last year but it is quickly becoming one of my favorites as well! Hi Carlee, who knew squash could be so festive? Love the flavours in this recipe. My favourite way to have squash in mashed with plenty of butter and fresh black pepper. Simple, but I like it. Squash really is versatile, but like most things it is easy to fall into a routine. Though now I want mashed squash! This is a great combination and looks fabulous! Thanks so much for sharing with us at Full Plate Thursday and don't forget to bring your Cookie Recipes to the Holiday Cookie Exchange Link Party!